We love to decoupage. 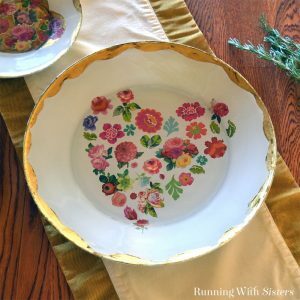 It’s so fun to transform an ordinary item, like a white plate, into something special with just a little clip art and Mod Podge. We made these Decoupaged Butterfly Plates for HGTV online. They were looking for inexpensive ways to add color to your decor. So we got three plain white plates and some butterfly clip art, and we started decoupaging! Here’s how we did it. The first step to making these decoupaged butterfly plates is finding the images you like and having them printed or copied on a laser printer. 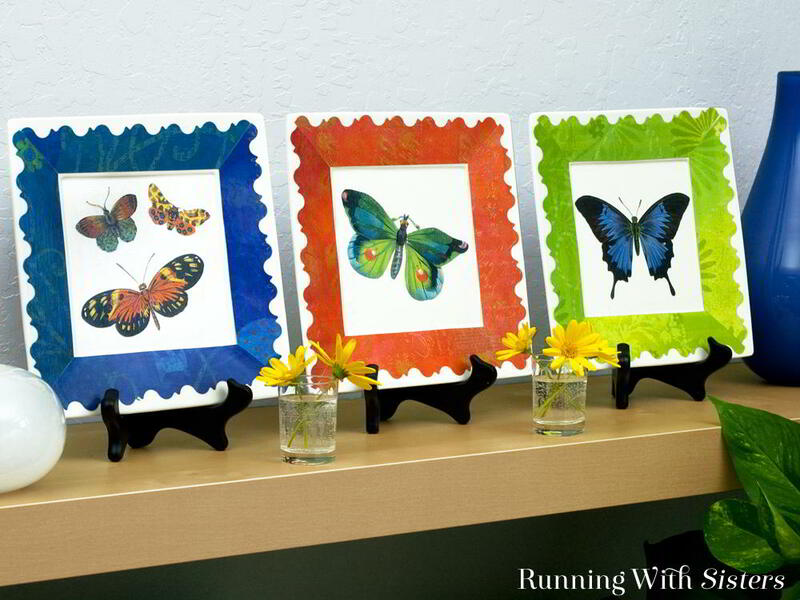 The Mod Podge is water-based and regular ink jet prints will run like watercolors. So laser prints are the way to go. And during this step you can resize your images so they fit your plates perfectly. We are Plaid Ambassadors and get all kinds of wonderful paint and other craft materials from Plaid. We love their products and used their Mod Podge for this project. 1. Wash and dry your plate. 2. Cut out your butterfly. Cut a decorative border from scrapbook paper. We made a scallop cut with decorative-edge scissors. You could just cut scallops with regular scissors. Miter the corners of the borders by cutting them diagonally. 3. 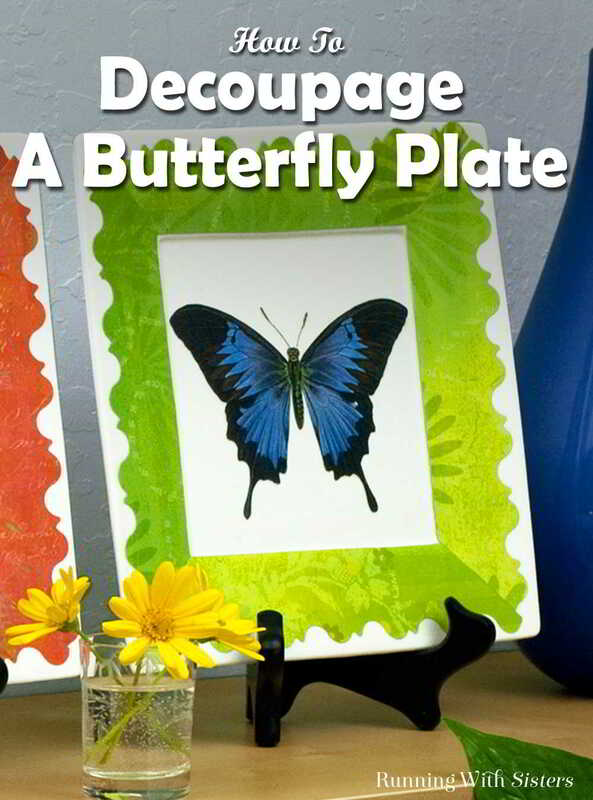 Decoupage the butterfly to the center of the plate. To do this, paint a coat of Mod Podge on the back of the butterfly. Place the butterfly where you want it. Paint a coat of Mod Podge over the top. Press the image down and gently push out any bubbles or wrinkles with your finger. 4. Decoupage the decorative border in the same way, coating the back with Mod Podge, placing the border, then coating the top with another layer of Mod Podge. Carefully align the mitered ends so the borders meet at the corners. Let dry. 8. To finish the plate, paint a coat of Mod Podge over the entire plate. We thought about making these decoupaged butterfly plates with Dishwasher Safe Mod Podge, but they don’t recommend using it in the areas where food will touch it. Well, we wanted a big butterfly right in the middle of the plate! So we decided just to use regular Mod Podge. These were meant to add color as a home accent anyway. Hang them up in the kitchen or display them on plate stands. To make a food safe version, use Dishwasher Safe Mod Podge (be sure to let it cure 28 days!) and don’t place the big butterfly right in the center. The border should be fine, though. 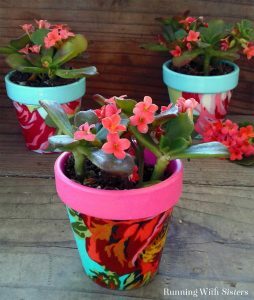 If you have any questions about how to decoupage with Mod Podge, just leave us a comment below. We are here to help! 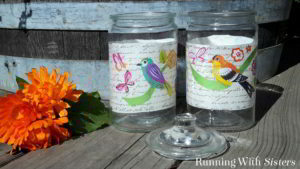 If you like to decoupage we have more fun projects! I love your wonderful website? I’ve fallen in love with how to make the fabric covered bird houses and the wrapping paper bird houses. Is it possible to purchase the videos you created – so I can learn how to make these darling bird houses. Thank you – your website is amazing and so much fun to look at and learn.